I’m in Brazil! It’s so surreal and unfortunately I caught some sort of cold on the plane. But I’m here, drinking lots of fruit juices with ginger and trying to get better. The hardest thing for me so far here has been trying to find vegan options when we’re going out to restaurants (the language barrier is the first issue, the second is the vast amount of non-veg options out there). 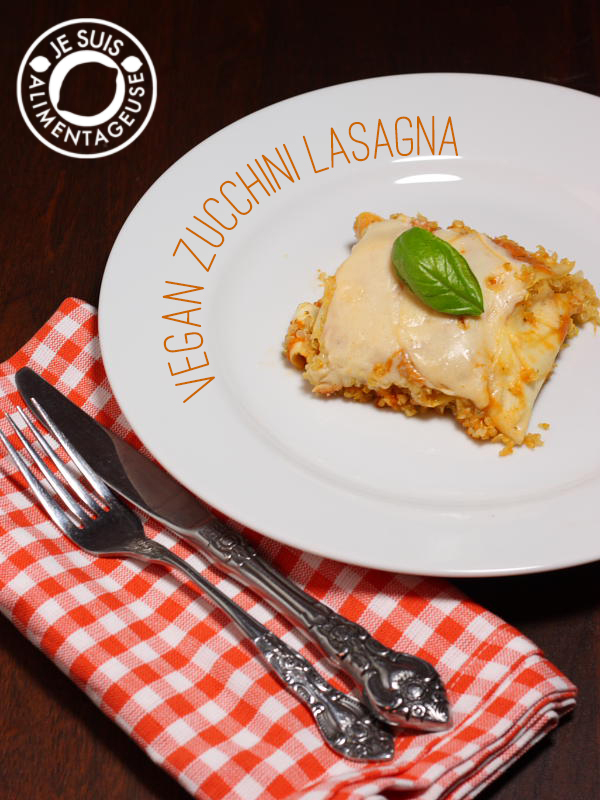 It’s really making me wish I had some of this vegan zucchini lasagna right about now. Luckily for me, the friend with whom we are staying lives really close to a super market and I can buy lots of amazing, organic and locally grown fruits and veggies that are going to become delicious vegan meals. I won’t be blogging any of the food that I make here, but I’ll talk about what I’ve been eating here. 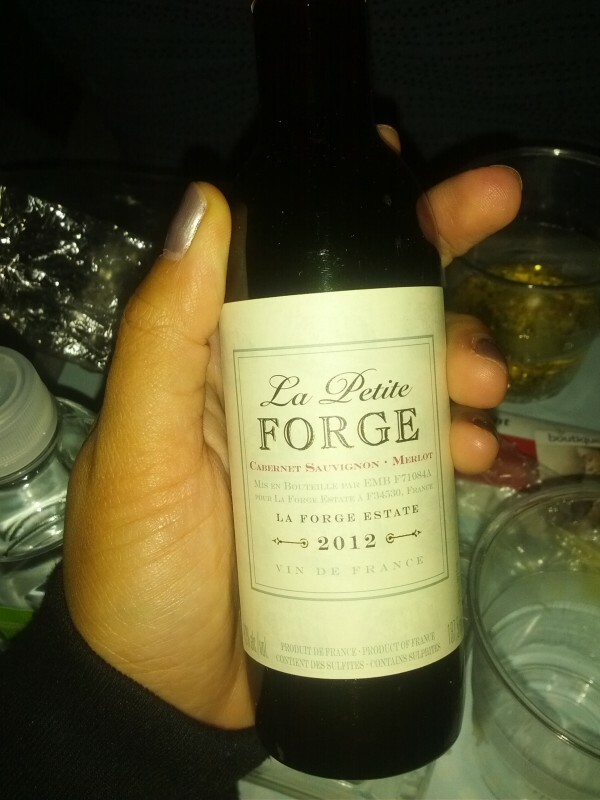 They even gave me a free mini-bottle of wine! Not too shabby. 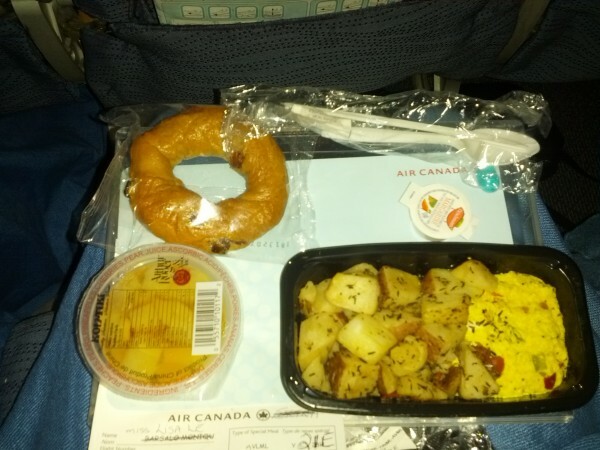 Since it was an overnight flight (10 hours, departing just before midnight), we had breakfast about an hour before we landed, and again I was impressed with their tofu scramble with potatoes. I got a fruit cup as well as a bagel with vegan margarine, served with the standard orange juice. 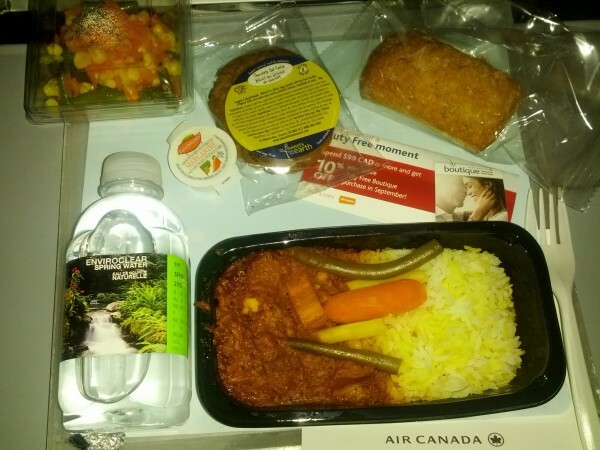 Air Canada, I’ve got to hand it to you, I’m impressed. I’ll definitely be flying with you in the future because I know I can eat your food (and it was pretty good too).Â When I flew Porter, I couldn’t eat anything but the potato salad (they had chicken wraps or ham and cheese sandwiches), but now that I’m trying to transition to vegan, I can’t even eat that anymore. Now, a lot of people associate the word “vegan” with “disgusting healthy cardboard”. I would like to first of all, debunk this theory with the following things that are vegan: Oreos, Airheads (the candy), Clif bars, Fritos, Fruit by the Foot, Sour Patch Kids (a personal favourite), Pillsbury crescent rolls… the list goes on. None of these things are particularly that healthy, but they taste awesome. (Clif bars can be healthy, but I know a lot of people who use them as meal replacements, which personally doesn’t seem healthy to me). My own personal vegan concoctions have included corn bread, green tea cupcakes, red velvet cupcakes, soup, soup, and more soup (can you tell I love soup? ), a quinoa and black bean wrap, hummus, polenta, vegan popcorn chicken…this is just stuff from this summer! 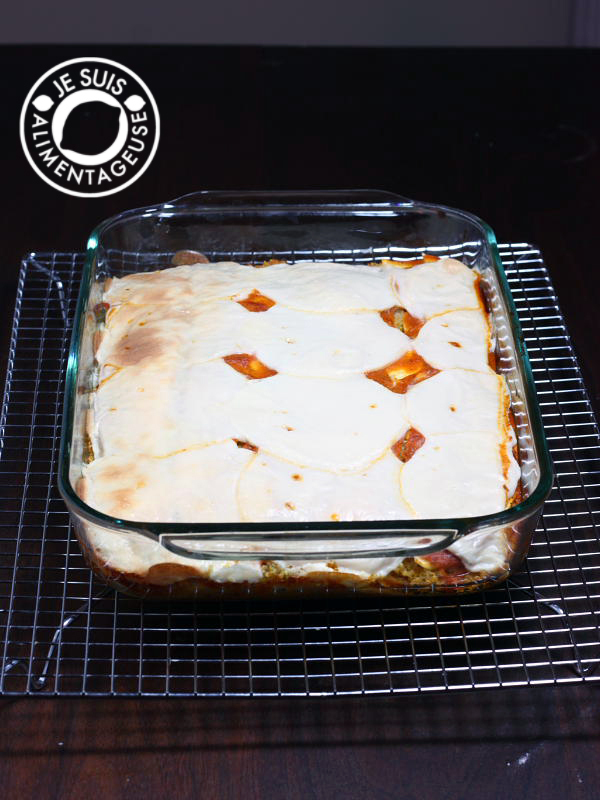 Now I’ve made some lasagna that’s less pasta heavy, more protein heavy, with lots of flavour! You can also customize this recipe by adding other vegetables like eggplant, mushrooms, a layer of peas, maybe even some sweet potato. 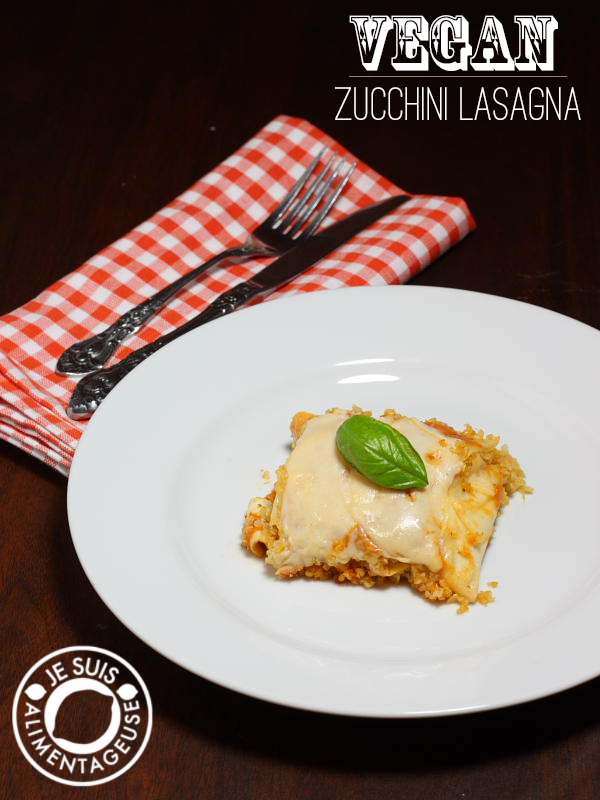 The Daiya Swiss-style slices add a familiar creaminess to the lasagna (good ol’ tapioca-based cheese) that melts and is totally dairy-free! Plus I used up the last jar of my simple tomato sauce (that is surprisingly really popular on Pinterest and My Recipe Magic), which made the lasagna perfectly saucy, not not so saucy that the zucchini was soggy. I had two friends who aren’t veg over, and they liked the lasagna, and then the next day I proceeded to have the leftovers for breakfast, lunch, and dinner. Whoops. But it was just so darn good. Plus I added some extra nutritional yeast and tried some of those vegan Parma packets from the Toronto Veg Fest. DELICIOUS. Anyway, enjoy the recipe, be sure to follow my Facebook page (check the sidebar) for updates and Instagram photos of my trip in Brazil! Optional: Daiya mozza and/or cheddar shreds to add in between the layers for extra cheezy goodness. Cook the quinoa in a covered pot with vegetable broth for 20 minutes on medium low heat. Don't peek! Once 20 minutes has passed, remove from heat and fluff with fork. Set aside. 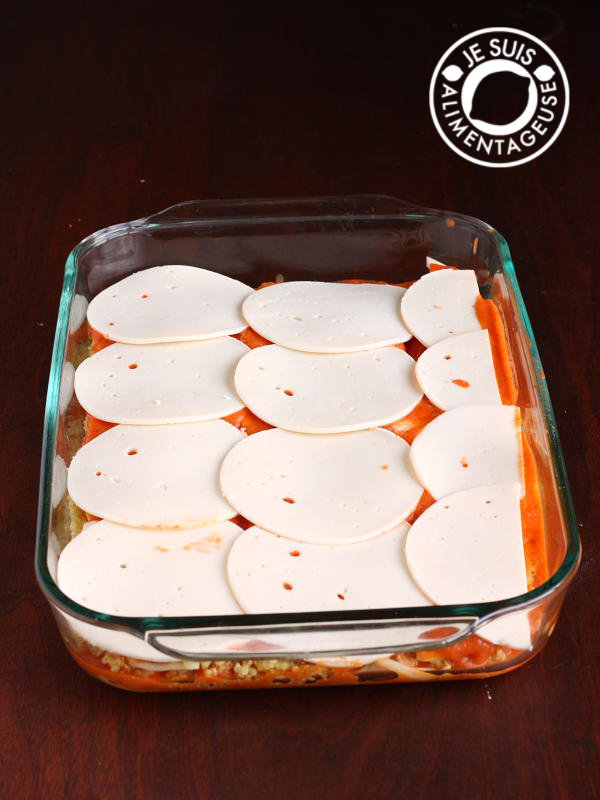 To assemble the lasagna, spread a thin layer of tomato sauce on the bottom of a casserole dish. Make the first layer of zucchini noodles, then spread another layer of tomato sauce on top. Add half the cooked quinoa to make the layer on top of the tomato sauce. If you have extra Daiya shreds, add a layer on top of the quinoa. Add a second layer of zucchini, tomato sauce, then quinoa again. I had extra zucchini and sauce, so I added another layer of that, then place Daiya Swiss-Style slices on top. Hi,When abroad use http://www.happycow.net/ app to find vegan locations around the world (or local of course) Find the links here: http://www.happycow.net/mobile.html Have fun! -jc. OlÃ¡ Lisa,I hope you're enjoying Brazil! Well, as a hillbilly from Minas Gerais, I'd suggest you to try some of our awesome fruits like aÃ§aÃ­, jabuticaba and for sure mangoes (better yet if you find the dulce de leche mango, it's amazing!). I just recently discovered your blog and I just love your recipes! They're are very original and just 'wow'! Thanks for sharing these "gostosuras"